In October 2016 we were creating our first veggie beds and embarking on putting up our first polytunnel. Since then we’ve supplied hundreds of veg boxes to local people, attended community events, supplied local restaurants, showed scores of people around and loved (almost) every minute. We’ve received great response to our enterprise, with people both loving the service we bring to the local community and specifically the quality of our fresh, chemical-free, sustainably grown vegetables. 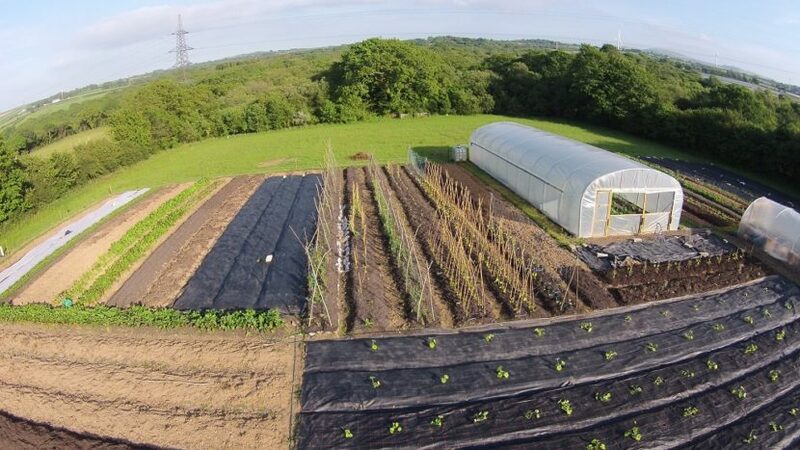 We grow a wide range of vegetables intensively in a small area using organic and sustainable methods to produce flavoursome and nutrient-dense veg, salad and herbs. Although we can’t claim to have made a fortune (yet!) it’s been a great year with lots of successful crops and lovely customers. All of this has given us the confidence to think that the Real Food Garden has a place in this community for the long term. So we are applying for temporary planning permission to live on our site. Temporary permission means we’d be allowed to live on site in temporary accommodation (like a static caravan) for a set period of time. We’d be granted permission if we are deemed to have a functional need, i.e. our business requires us to be there. We feel that our fast turnover of crops in our intensive bed system, the necessity to continuously respond to the weather in terms of ventilating the polytunnels, to carry out pest control and crop & crop cover management at all times of day and in all weathers shows our need. This year we lost around 50% of production of tomatoes alone because we weren’t on site at all times to control ventilation. This also affected our plant raising, meaning our baby veggies didn’t get the start they should, and our ability to keep growing conditions optimum outside as well. So whilst we’ve made a good go of it this year there are big improvements that would allow us to achieve the efficiencies and productivity required for a successful growing enterprise. To gain planning permission we will also need to prove our business is viable and covers our needs. Whilst no-one got rich growing veggies on a small scale our needs are modest and this year we have already gone a long way to showing what we can do impressive things in a small space. However our business growing veg can’t earn us the high wages needed to rent in the private rental market and certainly won’t put us in the position to buy a property nearby. Furthermore alternative local accommodation wouldn’t meet our need to be on site to manage our business. Therefore we feel that temporary permission to live on site is our only option to allow us to continue to grow the Real Food Garden. Besides our need to be on site we are proud that our business has a positive impact on the local community. Almost all our customers live within a small radius of the site, and many visit the garden regularly. We not only provide veg boxes to a community which has no services, but we also attend and support local community events, playing our part in ensuring strong, local resilience lasts into the future. We are also pleased to have received attention from further afield for being a working example of truly sustainable food production. Alongside our accommodation we’re hoping that 2018 will see us have a small honesty shop. This will further our service to the local community. It will provide the chance to pick up fresh, chemical-free veggies at the customer’s convenience. It would boost our ability to make the most of abundance in the summer. The shop could make a big difference to elderly, those with limited mobility or funds as well as allowing everyone to access nutritious food. So it’s been a big decision for us to make but we are excited by the prospect of putting down serious roots with our lives and business in the place and community we love. We want to expand our ability to feed local people with the best veg around and ask that if you agree that you support us. We hope our application will be in by Christmas and will let you know when you can submit your thoughts on it. Exciting times at Trelowarth!